This week we had a little fun down on the farm in Tot School. 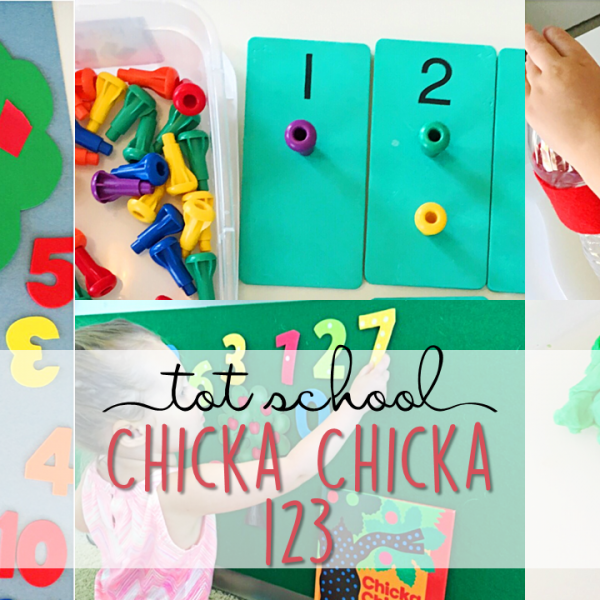 This was such a fun theme with lots of engaging activities to explore! 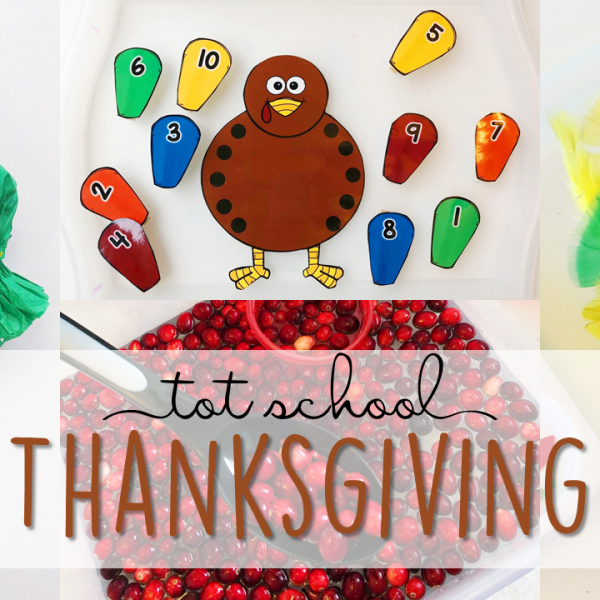 I love story inspired play, so we used an old favorite Mrs. Wishy Washy as the inspiration for this play dough tray. All you need is brown “mud” play dough, blue “water” play dough, a “tin tub” bowl, and a toy cow, pig, and duck. Madelynn also requested a brush so she could give them a good scrub. 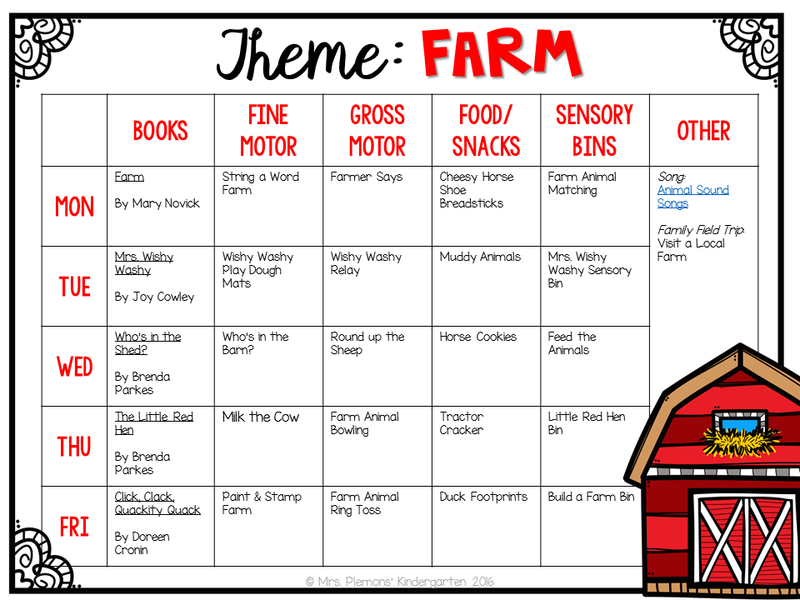 For more story inspired play, I created this “Who’s in the Barn” painting activity inspired by Who’s In the Shed? To prep, I printed a page of barns with animals inside, laminated it, then painted a thin layer of tempera paint over the animals. After the paint was completely dry I gave Madelynn water and a brush so she could uncover the animals. 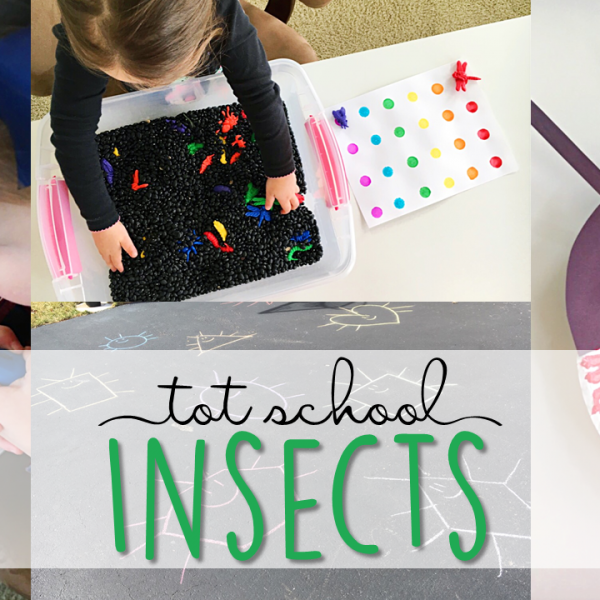 I see lots of possibilities for this fun activity in the future! I’ve been wanting to take Madelynn to a really fun kids farm in our area where you get to do a lot of hands on things like milk a real cow, but haven’t had the chance yet. So I set up our own little cow milking activity for her to try out. I mixed a tiny bit of white paint with water and poured it into a clear latex glove and closed it off with a rubber band. I drew on a few spots to make it more cow-like, then with it positioned over a cup I poked a tiny hole in the “udders” with the smallest needle I could find. We’ll see if she is brave enough to try milking a real cow when we make it to the farm soon! This masterpiece was a 3 step project. First Madelynn drew a black line across a sheet paper with a black crayon. Then she used watercolor paints to make the sky blue and the grass green. Next she painted a barn shape cut out with red tempera paint. She insisted that the barn needed a door first though so she drew that with black crayon. 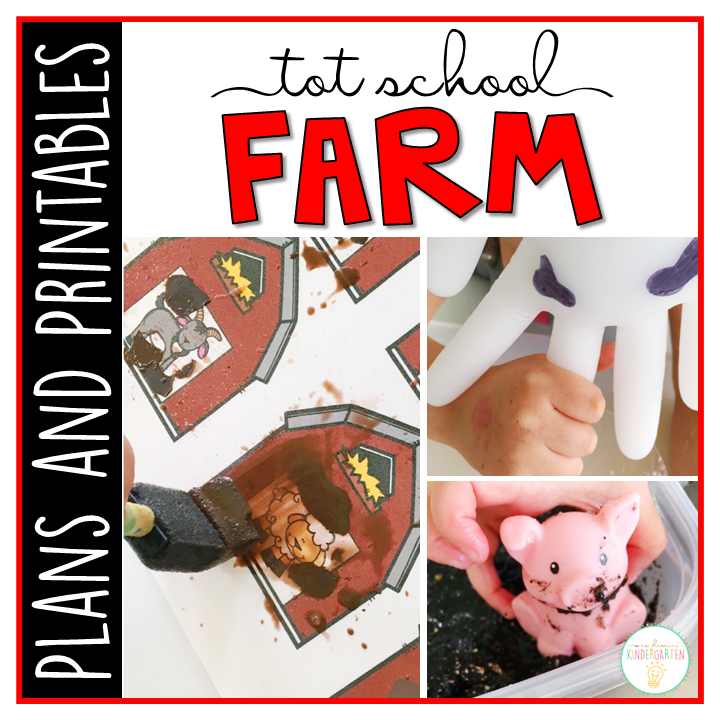 After both of those pages dried we glued them together and added farm animal stamps. For this themed Simon says game, I created cards with actions based on different jobs, and called out the action for her to follow (Ex: milk a cow, gallop like a horse, roll in the mud like a pig, etc.) She still not too good about listening for the “Farmer Says” vs no “Farmer Says” but this activity was great for getting some energy out for sure! This game was inspired by the Mrs. Wishy Washy story. I set out a tub of mud and placed cows, ducks, and pigs inside. Then across the yard I filled another metal tub with water and a scrub brush. Madelynn ran back and forth to wash each animal. This “Round up the Sheep” game was hysterical to watch. Madelynn chased balloon “sheep” around the yard, and tried to get them all back in the pen. All I did was draw a sheep face on some white balloons and set them free in the yard and we used our outdoor play pen to hold the sheep. Also great for containing rambunctious 3 year olds and their 1 year old sisters. To play farm animal bowling I started by placing our farm animal puppets on top of upside down red solo cups and they were the perfect fit. Then I set them up and gave Madelynn a small ball to roll. 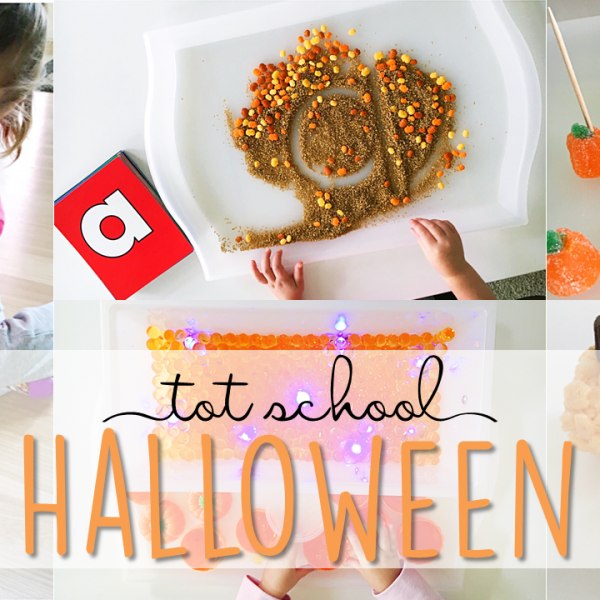 Easy set up and great for getting out some toddler wiggles. Farm animal ring toss (aka another way to get more play out of the same set up above!) I started by placing our farm animal puppets on top of upside down red solo cups again. Then we used paper plate rings and tried to ring each animal. This was much harder than it looks which means lots of running around to pick up the rings. Cheesy Horseshoe Breadsticks – Start with a tube of refrigerated bread stick dough. Form the dough onto the pan in a horseshoe shape. Brush with butter and sprinkle with parmesan cheese. Bake according to package directions. Muddy Animals – Start with a cup of chocolate pudding. Add farm animal crackers. Horse Cookies – Start with a Nutter Butter cookie. Use a dot of icing to attach candy eyes to the horse’s face. Attach peanuts between the cookie layers for ears. Use red and blue icing to add the details on the horses face. Tractor Cracker – Use to graham cracker pieces to form the tractor shape. Cover with green frosting. Add chocolate donut wheels.Use pretzel rods and Chex cereal for the details. Duck Footprints – Cut cheese slices into circles, then cut wedges out to form webbed feet. Add to round crackers. I love this! I am working with pre-school disabled and I have LOVED what you've put together! Such an inspiration! DO you have somewhere to get those adorable printables?? I love your farm words idea where did you get the alphabet beads shown above. Hi Sara! Love this project. 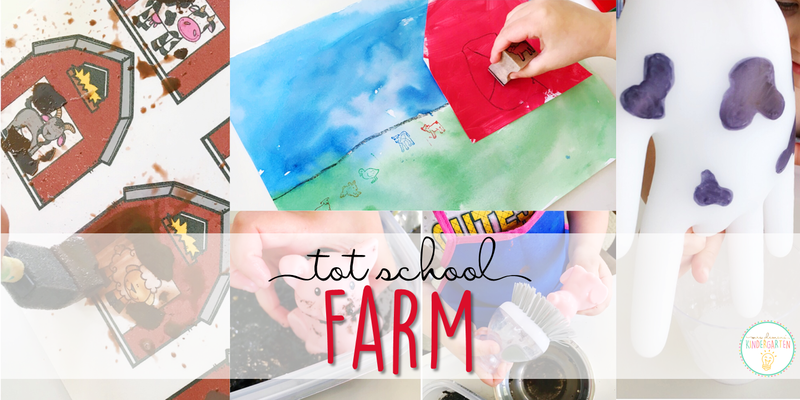 I linked it to my blog https://creativehomeeducation.com/farm-theme/ which I started last year and am working on networking this summer. Would love to connect with you about cross-promotion!